To be successful and achieve a goal in business, today’s uncertain economy completely depends on your ability and skills. There is no career which is safe to move over from one stage to the other from entry level to senior level. Almost all successful professional have curveballs which are thrown their way and they have to let them. Career setbacks are unavoidable and must be dealt with them at work. Maybe one must have lost a client, passed over for a promotion, the business may not have picked up, cope up with a computer crash which lost about five years of work. Apart from falling down, dealing with the setback is important. 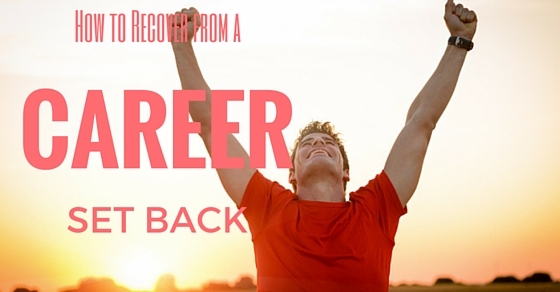 Let’s glimpse through a few tips about how to recover from a career setback. The following mentioned are few tips that help one to bounce back from failure to success. When a professional experiences a career setback, there would be a feeling like a failure. It would be advisable to handle one’s own emotion and do not let disappointment show out. Though you can be disappointed personally present yourself as a team player and that you assist the company’s decision. Suppose you’re fired from your position, that instance can be considered as a stepping stone for you to get started working in another company. You can get to your competitor and start working. Your services might get a raise if your work is mind blowing. When you’re seeking for the support you can always get to friends, family and trusted neighbours who are colleagues outside the workplace. Apart from gaining sympathetic ear from these supports, you can also gain an insight about what and why. Along with this online discussion groups, peer networks and personal options are ones that assist you in reviewing your options and get started with a positive attitude. When you have learned everything in an organisation, but still find it tough to move up in an organisation, this is the time where you need to expand your responsibilities and jobs. You can either hire an outsourced worker or train an employee to work with the repetitive tasks and get practice with the new tool. When you stagnated this would be missing. Also, utilise your extra time to attend funded training in the organisation. By this way, you will get to learn skills which are directly associated with the job. These are few aspects that you would miss while you’re stagnated and can overcome. In an organisation, an employee can get passed over for a number of reasons and suggestions to focus on. You may not have satisfied the employees hiring requirements. You may think that you’re a perfect fit for the organisations, but the organisation can have varied ideas. There can be some aspects regarding soft skills. In such cases, the employee must understand the scenario and where he actually stands. This can be considered as an indication to better know your goals in future. A workplace is a competitive place and here rewards are offered to people who not only satisfy the requirements but also surpass them by developing a perfect personal network. It is best to analyze what you’re lacking if its knowledge, personal network, experience, visibility, career portfolio and more. Understand the way you can enhance your future prospects and yourself. There must be an idea for every employee about what they require. They should focus on where they are and what they wanted to be. They also need to look through about what is missing; it can be a professional network, experience, skills and more. Design a plan as per it and close the gap. Now the employee may be clear about why he has been passed over and now it’s their time to decide. The employee must decide if he is to stay in the company and move forward towards next opportunity, stay back and work towards particular goals or to look for step up in another company. An employee has the rights to choose, they can figure out what they wanted and why. It is always good to allow yourself with ample time so that your resentment and anger are indulged at times of professional disappointments. The employee can wait until those feelings have subsided before he moves over to the next step. When the employee is able to look at the situation objectively, then he gets to a rational decision about the future. Accept the fact that any organisation would have challenges, setbacks, and obstacles in their career path. It is good to expect them during career and your goals can be ones that can withstand setback from time to time. Remind yourself that setback is temporary and future is bright ahead. By having a positive perspective, there is a lot of difference in the way one handles setbacks. At times of setback anticipate the upcoming obstacles and prepare a contingency plan for them. The employees should have a growth mindset where they are ready to cultivate their thoughts even after a setback. Such a mindset is mandatory to confront the challenge and make progress. When you’re prepared for them then you are looking through the setbacks as opportunities rather than failures. It is quite obvious to focus on negative aspects both in personal as well as career life where positive thoughts are rolled off. By this way, one’s career path and projects are completely redefined by negative thoughts. Here, the employee’s passion is abandoned and hence it is better to change the approach and move in a positive manner. At times of setback, it is good to face the situation with a positive perspective. Challenge growth and failure may come the way as you move in your career path and is required in order to achieve a goal at times of defeat. Hence, it is good to provide a bit space from initial setback where your rational side can regain control and emotions can be permitted to cool down. Take a look at the scenario with new eyes and a perfect way to proceed. Every successful professional has overcome a career failure or setback in their life which was career ruining and massive ones. But such massive failures were forgotten as they were overcome by great success. At times of career slip up, it can be beneficial to share your experience and get to know how he or she has faced setback and emerged out as a strong one. Acceptance is an important factor as it helps you understand the true fact that you hit the road block and now it’s time for you to figure it out. By this way, you can shake off negative feedback, absorb criticism in the present and also move ahead in an innovative way. When you have the capability to accept and face the failures then you can avoid career regrets present. By this way, you would be more at peace moving along with your efforts and decisions rather than internalizing with negative thoughts that avert you from pursuing your dream. About three-quarters of American workers are not actively engaged in their work as per study released by Gallup in 2011. A prolonged boredom literary skill is an aspect and if you belong to the same category, you can explain to your boss that it was an awesome work but you’re bored. You can mention your boss with the inner details that when there is a lack of interest at work, and then the productivity of the organization would go down by some factor and lead to spending to a certain factor. By this way, you may have a shift in the work process which can make it interesting and you may avoid setbacks. Whenever an employee is caught in a setback they go through a rough patchwork. The best way to carry over things after a setback is to accomplish a positive outcome in future. The employee may be unhappy about what happened in the organization, but he needs to stop replaying the situation and focus on aspects that need to change and also work to make them happen. Irrespective of the setback an employee faces, it is important to put its perspective. It is always easier to say than doing it, but when your fixed mindset is changed and you redefine success then this setback can be one that can propel you to future that you imagined. Your self-esteem can be blown off with any kind of setback, but it is necessary for you to regain confidence and rejoin the game. Randall mentions that people are motivated at work by their reputation, positive feedback, and aspects that boost self-esteem rather than money. So when our self-esteem is hit, it would hurt more than anything else. Hence, it is good to stay positive and understand that your performance is the reason to affect your well-being. Hence aiming to achieve good performance is necessary. Working in a positive environment which is supportive is necessary. When you’re fired or face a setback, you would be probed about your dismissal in almost all job interviews. The employee should prepare answers for awkward questions in a positive and honest manner. It is also important to remember that the employee should not talk low about himself and also about his previous organization. The situation must be presented as a learning experience and show that you have learned from the experience. So it is good, to be honest and face the situation. The idea of shortcuts may be loved by all, by winning in your career takes about lifelong learning and insights which can be achieved by facing a series of challenges and dealing with setbacks in the career. The best example which can boost employees who face setback is about Steve Jobs. The fact is that he also got fired from Apple which he founded and mentions it as a trying experience. After years, he realized that the best period was when he got fired from Apple as it was the most creative period in his life. Setbacks in a career can be viewed as a period that leads to real success. Getting the help of a mentor or coach can be one way where they can assist you in dealing with challenges in life. These mentors are ones who are credible and are able to understand the career issues that you could face and help you recover from failure to success.. In the same manner mentors and coaches outside the business, areas are ones who can share with you how business leaders respond. A career setback does not mean that your career life is set to a permanent downhill but it can be considered as a chance to reassess your direction and move towards success path. A sense of control and purpose can be experienced after setback which helps you overcome the situation and move on. A setback in the career can be the situation from which one can learn from and move ahead. Hence possessing a positive outlook is mandatory by which employees look at setbacks in a positive manner rather than being depressed. Career setbacks are unavoidable and employees should navigate to the root cause and work accordingly rather than being puzzled or feared. Career has a long way to go and in order to reach success; there are a number of milestones and challenges where career setback is one such challenge. When there is a career setback, employees are to face them with confidence and positive tone to attain success. Next articleBuilding Trust at Workplace – How Important Is It?